The $1 billion remodeling of Reagan National Airport is adding even more challenges to getting around inside the airport. However, that’s just one more issue with DCA, as it’s called in airline-speak. Just getting to the airport can be the moral equivalent of a nightmare. Driving yourself can be not only difficult but hazardous. The Capital Beltway - The Maryland portion of I-495 (especially in Prince George’s County) has had a long history of accidents and slowdowns. It is not at all unusual for traffic to be at a standstill for hours after a crash. If there are any fatalities during one of those incidents, it is entirely possible for the roadway to be closed. To add to the potential for accident-related delays, Beltway road resurfacing is in the process for Maryland, between Silver Spring and the I-270 split. That work is expected to continue through 2018 - and possibly longer. I-95 – This roadway also has a history of frequent crashes and, again, slowdowns and complete stoppages, particularly in the Howard County area of Maryland. Deer on the roadways – Maryland and Virginia are ranked among the worst areas for accidents involving deer running into traffic. Deer-related traffic issues for the two states are the highest in the country. Traffic pattern changes - For the foreseeable short-term future, construction of new security checkpoints and additional traffic changes, particularly those above the roadway will cause issues with drop-offs and pickups. Parking – Because of the airport’s small footprint, finding a parking spot is problematic at best. On more than a few occasions, there have been NO available parking slots. At any time, trying to find one is a hassle. Stoppages of the Metro for fires and accidents (including a recent one where a person was hit by a Metro train near L’Enfant station) are continuing issues. So are the disruptions when police pursue fare-evaders, causing any number of delays. This issue has reached a point where the DC Council has been considering stopping the efforts to catch and ticket/arrest offenders. The airport authority has also said that the re-construction effort means that while entrances to the airport from the Metro station will remain open while security areas are re-work, the moving walkways may be closed. Metro issues may not occur when you are planning to get to DCA, but when they do happen, the resulting delay can wreak havoc with being on time to get to and through security and to your departure gate. Taxi service – Although the vast majority of taxi drivers are very reliable, good taxi service is never a given. Taxi drivers can be inconsistent, and you can never tell whether your driver will be knowledgeable, experienced, or even able to communicate with you. Any issue with a taxi can cause a major delay in getting to the airport on time. There is also the question of additional fees. Although the Zone-based fee has been dropped, there are still many contingent charges that mount up. Just because your rid begins at DCA, the taxi stand charges $2.50. The dispatch fee is $2.00 by phone. If you scheduled ahead of time and the driver is left waiting, you're paying $25 per hour and if it's snowing and there's an emergency, tack on $15 more. Culdesac can’t change the way the roadway, the airport, or the Metro work, but we believe that our service is the superior way to get to DCA on time and without more stress. Our black car, limo, and coach drivers are highly experienced and equipped with state-of-the-art GPS and traffic routing support to avoid the problems that can crop up. We are aware of all the traffic and event delays that occur on a minute-to-minute basis, as we have dispatch managers monitoring traffic patterns 24/7 to find alternate routes. We are well-known and respected frequent visitors at every airport, including Reagan International. 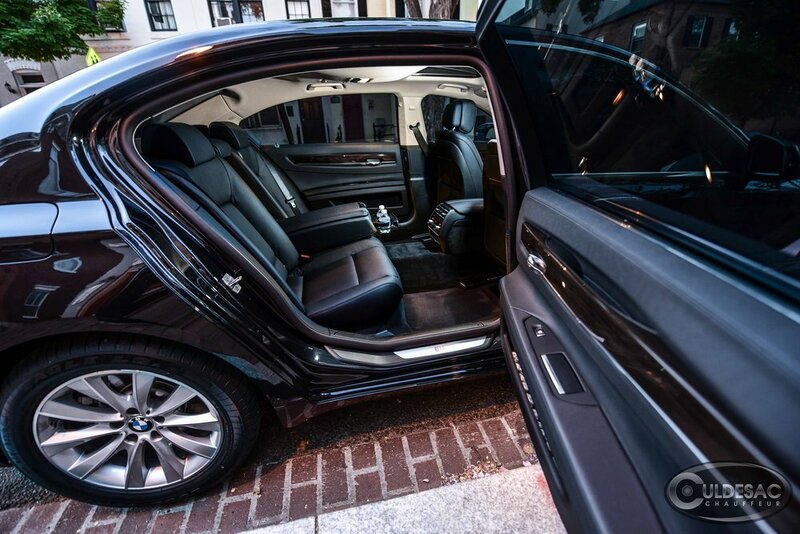 Travelers can be confident that we will extend every effort above and beyond the call of duty to get them to their destination in a timely manner in a luxurious and comfortable environment. Our vehicles are equipped with all the electronic aids – from USB ports on up – to allow our clients to have the best of trips, every time.